Kajol received the NBT award for her husband Ajay devgan in a manish malhotra black color saree with lace work border and simple half sleeve blouse.Tied hair and mahesh notandas jewellery complemented her look. For Vogue Wedding show,Sayani gupta walked the ramp in a bridal rich work wedding lehenga with designer jewellery. 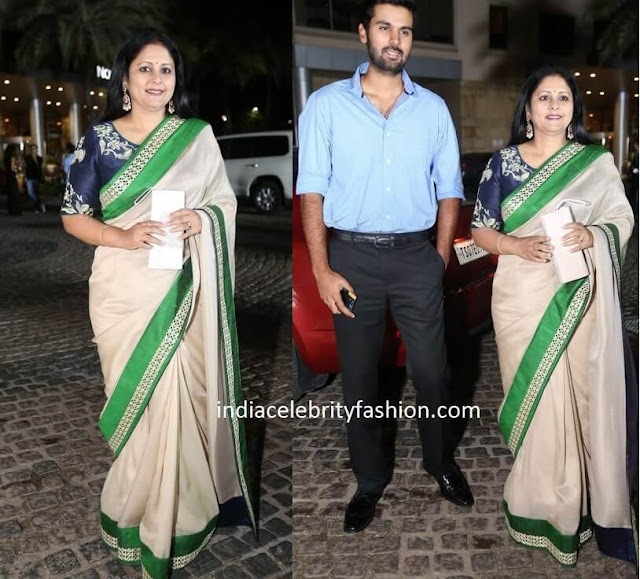 At 63rd Britannia film fare south awards 2016 event,Jayasudha wore a simple saree with designer border and quarter sleeve work blouse.She is spotted along with her son. She looked good with chandbalis! For Britannia film fare awards 2016 south event,Nayanthara rocked in a black mint blush pleated dress.Side swept curly hair,suhani pittie ear cuffs,rings and blue pointed pumps complemented her look. For Kanika dhillon's 'The Dance of Durga' book launch in chennai,Anushka shetty wore a printed anju modi full sleeve salwar kameez with net dupatta.Side swept hair,aquamarine earrings and heels complemented her look. She looked beauitful as ever! For SYTYCD dance shoot,Madhuri dixit wore a yellow color abu jani sandeep khosla georgette saree with embroidery work border paired with matching short sleeve blouse.Half up half down hair,bindi and png jewellery made her look even more beautiful. For CineMAA awards red carpet,Rakul preet singh donned a rabani and rakha beige color shimmer net saree with fringes paired with one shoulder blouse.Short side swept hair and h&m jewellery completed her look. At Viacom 18 five year completion bash,Tabu was spotted in a white shirt type kurta with statement style neck line and salwar pant.She paired with it jhumkas and glitter heels. 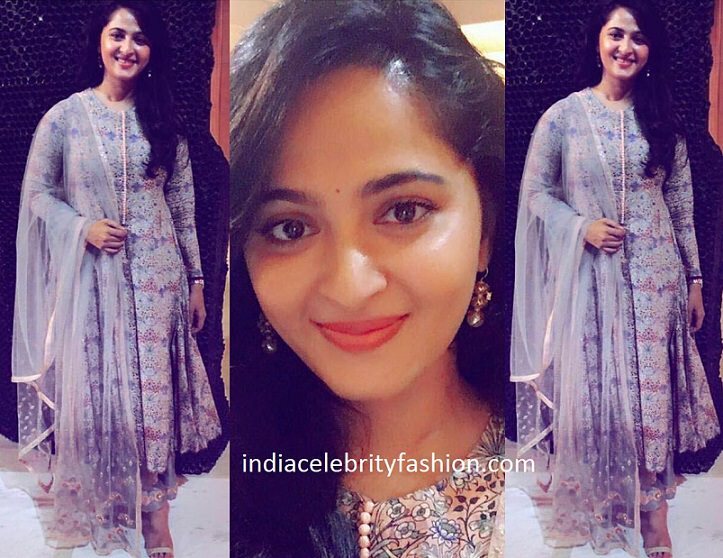 At SIIMA awards 2016 press meet in chennai,Vedika was photographed in a versace blue one shoulder stylish dress.Side swept wavy hair and glitter high heels completed her look. At a recent cafe opening rakul preet was seen in a nitya bajaj label long black dress with center rose embroidery work.Center part sleek hair,ghanasingh be true ear studs and ring completed her look. For her friends book launch event,Aishwarya rai donned a anjali jani full sleeve white shirt and patine printed long skirt.Side swept hair,red lip and white dior handbag complemented her look. 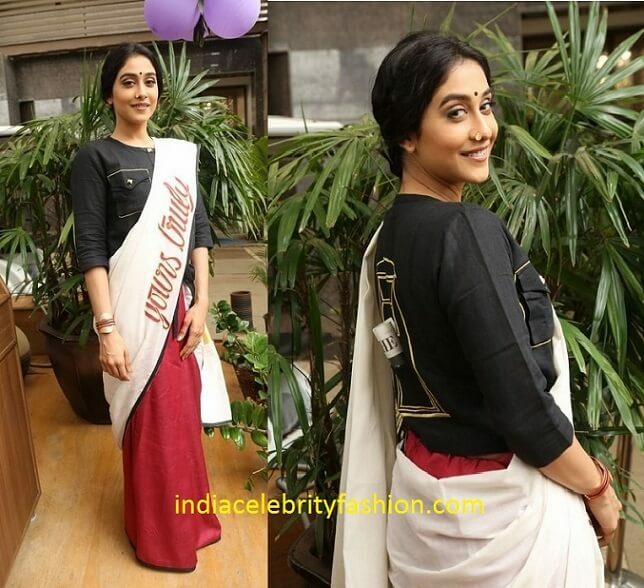 For Cancer Survivor day event,Regina cassandra donned a Sreejith Jeevan concept saree with handwritten words and black concept blouse.Updo hair,bindi and suhani pittie jewellery completed her look.